Big ups to the Okanagan Symphony Orchestra (OSO) for sharing the Kelowna Community Theatre stage on the first Saturday night of April with a Canadian songstress who absolutely captivated the house with a mezzo-soprano vocal style I’d define as good “Slean” living. 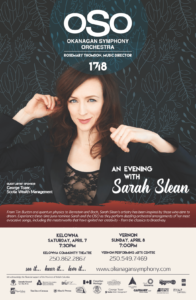 All puns aside, Saskatchewan’s Sarah Slean was the guest artist who describes herself as a dare-to-dream Renaissance woman, singer-songwriter, keyboardist, poet, visual artist, and occasional actress. She pretty much put all those creative skills on display during a two-hour lyrical lesson that was superb from first note to final encore. On the evening’s playbill, the performance was entitled the “OSO Special: An Evening with Sarah Slean” presented by The Chase Wines. 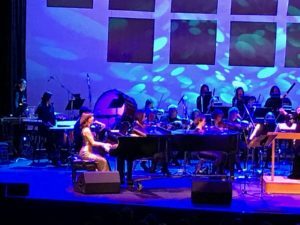 That raised an interesting “chicken or egg” debate as in whom did the almost-sold-out crowd come to see – the dynamic hometown orchestra or the three-time Juno nominee? Diplomatically speaking, let’s call it a tie….. or more succinctly a win-win. The OSO, led by irrepressible Maestra Rosemary Thomson, was at the top of its game and showcased its versatility in handling diverse arrangements. Slean, singing mostly her own stuff and a few Broadway classics, meshed beautifully with the orchestra even though we can assume they had very little time to practice together. Having developed her acting chops on worldwide stages, Slean was an equally accomplished and quirky thespian. While she played piano and crooned, she naturally delivered playful head-bobs as her brunette locks bounced from side to side. She was adeptly playing the room and keeping all eyes upon her. It worked. There was a clarity and gripping emotion that effectively won over the audience. Being unfamiliar with Slean‘s work, I approached the evening with an open mind. I knew what to expect from the OSO, but Slean had a clean sheet (as they say in soccer) even though she had released 11 albums during her 20-year career. She won over me with her powerful voice and geeky personality. There was a method to her storytelling madness and it was delightful and engaging. My favorite numbers, and most of the crowd seemed to follow suit, were the ones Slean borrowed from Broadway. In the show’s first half, she sang Somewhere Over the Rainbow (“everyone wants to be Judy Garland,” she said afterwards) and Mein Herr from Cabaret. 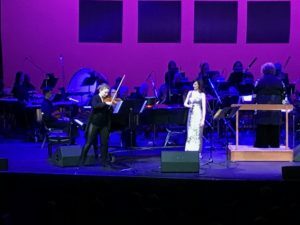 This number started off with OSO Concertmaster Rachel Kristenson performing a violin solo as Slean joined in with a sterling Sally Bowles redux. After intermission, Slean did a slew of her old and new material – Every Rhythm is the Beat, 1,000 Butterflies, Holy Ground, Nothing But the Light, Sound of Water, and Parasol (she described it as a “very weird” song). She got the biggest rise when she sang the very-familiar I Dreamed a Dream from Les Misérables. 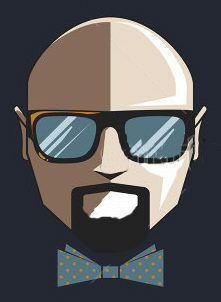 Big Finish – next up for the Okanagan Symphony Orchestra will be OSO: Triomphe! – Masterworks VI on Friday, May 11 at KCT. The show will feature Beethoven’s epic Triple Concerto performed by Canada’s Gryphon Trio. This stirring performance, also including Dvorak’s Symphony No. 7, will close out the OSO’s 2017/2018 season.